Do you live in the DC area? Do you love fish, mollusks, crustaceans and all things pulled from the sea (aside from dolphins of course, that is unless you live in Japan)? Are you tired of the limited seafood selection found at your local supermarket? Have you found yourself wondering where you can find some fresh octopus or a whole bluefish? Well do we have the answer for you: it’s called the Wharf (aka Maine Avenue Fish Market). The place has anything you could possibly need from salmon heads to jumbo Alaskan king crab legs and everything in between. The Wharf is a local DC secret and is devoid of the omnipresent John Q. Tourist who tends to clog up most DC attractions. The Wharf attracts all walks of DC life from smug Georgetonians picking up Chilean sea bass fillets to immigrant families eating freshly steamed crabs out of the back of their trucks, heck even Anthony Bourdain's stopped by. So local landlubbers put on your sea legs and head on down to the Wharf, That's What She Fed guarantees that you won’t be disappointed. The Wharf is on Maine Avenue SW right by, appropriately enough, the Maine Avenue exit off of US-1. It's open every day from 8am to 9pm. The fish market is made up of several floating barges docked on a pier. It’s pretty cool, there is a gap between the docks and barges, so be careful not drop your credit card while paying as it will wind up in the Potomac. Depending on tide levels, you will either be looking down at the display tables of fish or standing on wooden boxes looking up. Walking around the different barges and picking out your fish is quite the experience for sea food lovers. The variety is the best you can get in the area and will captivate your interest as you survey the different species. You’ll find yourself saying things like “Ah, so that’s what a tillapila looks like” and “I didn’t realize catfish were so slimy.” Take your time as you walk around, don’t feel rushed. I say this because the barges are filled with fishmongers who will yell at you as you stroll by asking if you need any help. Girls may be used to strange men aggressively yelling at them, but this can be a new experience for our male readers. Just politely ignore them (I try and avoid eye contact) until you’ve made your rounds and come to a decision on what you want. A fishmonger and his crawfish. Don’t bother price comparing at the wharf. All the mongers are in cahoots. If the feds ever opened an investigation on the wharf there would surely issue indictments for price fixing. Any decisions should be purely made the quality of the fish. Ask to inspect the fish you are interested in. For filets, the flesh should look like good sushi, a deep and rich color. If the filet has skin, it should be shiny and metallic. The meat should be resilient to the touch. Avoid filets covered in milky liquid as that is the first stage of rot. 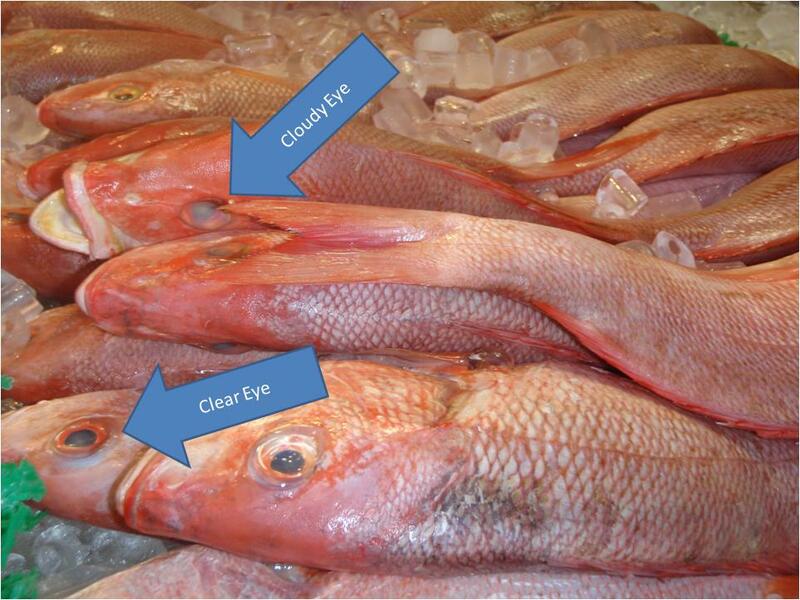 Selecting whole fish is all about the eyes. 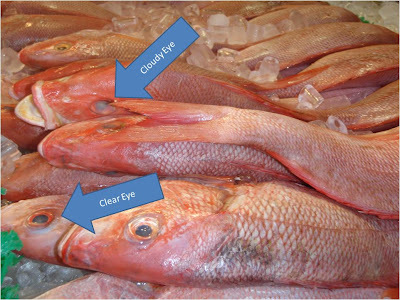 Pick a fish with bright and clear eyes, a fish with dull eyes is past its prime (a fish with bloodshot eyes is probably high). The scales should be shiny/metallic and the gills should be a dark red. You should always smell your fish. Don't be shy, if you smell the fish you will look like you know what you are doing. Fish shouldn’t smell fishy, they should smell like clean water with a hint of the sea. Finally, utilize that monger, ask him when the fish you are considering came in, if it is local caught, if it was frozen and ask him what are the fish that have just come in. Always remember that they are ultimately trying to move product and may try and pawn off an old fish on people who don’t do their due diligence. A pile of red snapper. Be careful. Notice the one on the top has a cloudy eye and the one on the bottom has Visine clear eyes. You will be handed the fish on the top of the pile unless you specify. The wharf is the best place in DC to pick up a case of crabs (even better than Fur Night Club). Most every barge sells crabs. Like the fish they are all the same price so follow those that know and go to the crab stand with the most people gathered around it, it’s probably the best. They offer both males and females in a variety of sizes. We once watched one of the mongers go through the “sorting” process. Your best bet is to go with the smaller and cheaper crabs since there seems to be no rhyme or reason to the sizing. We personally like the meat on the males better, but females offer the potential of a good stash of roe, if you’re into that sort of thing. They have live and presteamed crabs. ALWAYS go for the live ones. The mongers will steam and season live crabs free of charge, it usually takes about 20 minutes. There is no telling how old the presteamed crabs are or if they were even alive when they were cooked. A half bushel of crabs will feed six people for several hours, most will give up before you get through the entire box (like pimping, picking ain't easy). Prices vary depending on season, day of the week, and if the mongers have bills to pay. Expect around $50. Check out this No Reservations clip, notice Bourdain gets precooked crabs “reheated,” rookie mistake. This place usually has free samples. Captain White has the coolest sign by far, it lights up at night. This spot is good for getting some fresh shucked oysters. TWSF does not recommend getting any 'sandwiches' from anywhere, horribly disappointing. TWSF was there during high water levels, check out the boxes people are standing on. The white stuff is cleaned calamari. Rockfish. The tags through the mouths signifies that the fish were caught legally following conservation laws. The colors identify which state they were caught in, well not literally in the state, the waters off the coast. Q: Why did TWSF go to the Wharf? A: No reason, just for the Halibut. Not really sure what these things are, but they look pretty gross.